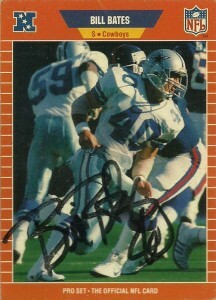 Bill Bates is a special player and is one of those players of Dallas Cowboys lore. Undrafted out of Tennessee in 1983, he’d sign a free agent contract with Tom Landry’s Cowboys, where Bates excelled as a fan favorite and a special teams commando.. Undersized and considered slow, Bates had a heart and a motor that made up for both of those shortcomings. His ability to get down the field and uncannily make the jarring hit on the returner was so unbelievable that the NFL basically created a special teamer’s slot in the Pro Bowl just for him. He was named AP and to the Pro Bowl in 1984. 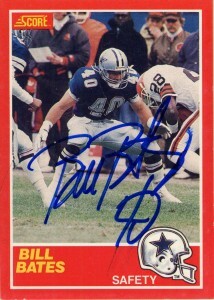 Bill early in his career was also utilized well on safety blitzes as he made 9 sacks over his first two seasons. He had a career high 4 interceptions in 1985 and a career high 124 tackles in 1988 from his strong safety position. With a new coach on board (Jimmy Johnson) in 1989 there was some fear that Bates would be cut. Instead he found himself back on special teams again where he remained a key backup with the team through 2 Superbowl victories and retirement after the 1997 season. Bill has remained quite active since retirement and has spent time as an assistant coach with the Jags and at the high school level. He’s been a motivational speaker, penned his own autobiography and owns a ranch outside of Dallas. 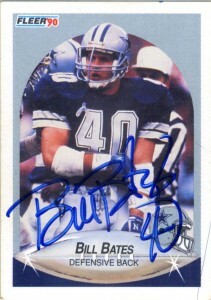 -And of course Bill Bates remains a Cowboys spokesperson.